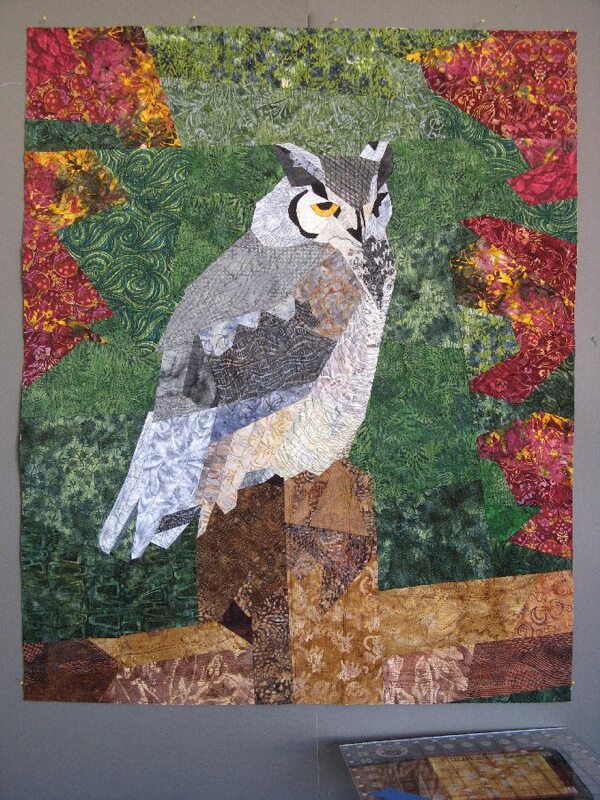 My Great Horned Owl quilt… Almost done! I promised myself studio time this year as a first step to letting myself sew more. But every time I walk into the room, I get lost. I’ve been telling myself I need to get organized (again), clean up (one more time), and then I’ll be able to get to work (at last). But my attempts to get organized have shown me that what really needs to happen is something I hate doing: I need to let go. I have been quilting for about 20 years, and I have plenty of quilts already under construction. I’ve decided one of my intentions for my studio time this year is “finish”. I am nearly done with the owl quilt I designed in Linda Beach’s class last March, so it’s time to choose my next project to finish. In order to make an informed decision, I started making an inventory of my works-in-progress. If you’d asked me last week, I would have guessed I had about 20. With 40+ projects to choose from, it’s hard to know where to start. I didn’t put these projects down because I was bored. I put them down because I was stuck. In most cases, I need to make a decision. I have to make fabric choices or decide how I will set the blocks I’ve made. In a few cases, the next step is unpleasant. For example, I have seven quilts that just need to be basted (a step I hate) so I can quilt them (a step I love). The bad news is: I can’t finish all this stuff. The good news is: I really don’t want to. I started some of these over ten years ago. Some I still love, but I’ve lost interest in others. So my next step isn’t cleaning the studio out or even finishing the inventory . It’s looking at what I already know about and deciding what to do with each project. I am dreading making these choices. Choosing between my projects is going to be hard. I recently made myself finish a book I didn’t like because I’d paid full price for it. If I feel like I’m invested in something, I find it hard to let go. But letting go is what this is going to be all about. Letting go of perfection, letting go of old interests, letting go of old dreams. I could try to keep everything without finishing it all, but it’s taking up more than physical space. These projects are cluttering up the creative space in my mind, space I need if I’m going to start anything new*. So I will have to discipline myself and let some things go. Do you have WIPs cluttering up your house and mind? How do you decide what to finish and what to release into the wild? *I know what you’re thinking. “You’ve already got 40 quilts to make! You don’t need to start anything new!” But I know myself. I need variety, or I curl up in a ball and die. How do you think I wound up with all these projects in the first place? Amazing how they pile up, isn’t it? As I said, I’m torn, because some of the projects are worth finishing, and some I hate to set aside or send away, not because I’m dying to work on them, but because of how much time I’ve already spent on them. I intend to listen to my gut and start with the stuff that’s most compelling, and reconsider my plans for the stuff I’m least interested in. That is a gorgeous quilt! I use to quilt all the time when I was a young wife and mother, loved it! I finished my last quilt about 2 years ago, I was so frustrated with it! It took me 2 years to hand piece the top so I decided to break my code and got someone to machine quilt it unfortunately she didn’t lay it out like I showed her so I had to figure out another way to finish the quilt. Finally a quilter told me of a lady who fixed it for me. that fiasco cost me $200 total! Next time I’ll keep to my code of just hand stitching! But I do love my quilt!!!!! I think the time and effort spent gives me a deep connection with the project so that the product has a lot more meaning than it would if I bought it from someone. While I am anxious to finish things, I try to remind myself the whole reason I enjoy making them is because of the process. I’ve gotten really good at putting down books when I lose interest, but my art projects are tougher to turn my back on. Started dealing with some of them last night. One is a failed art quilt. I decided to salvage the nice hand-dyed fabric in it and so I cut it up, but when I put the other part in the trash, it bothered me. I think I’ll take it out and add it to the pile of stuff to cut up and use in new ways. It must be a million times harder to put something down when You’ve actually put the work into it to begin with! It must feel great when you recycle something you didn’t love into something you do though! I don’t have much experience yet in the recycling part, but I hope it helps me not to get too upset about letting go of old projects.